How do you stop terror that doesn’t fight with conventional weapons? How do you combat a myth who simply walks among the people, competing for nothing more than to stay alive? These are the questions government agent Carter must answer when he teams up with Dr. Stella Hunter, a scholar of mythology, to stop the Peacetaker, once assumed to be a legend of the past, before he can strike again. In Ribbons of Death, Edith A. Petrick weaves a unique story that puts a terrifying legend in a modern setting. The result is a book that will be tough for readers to put down. Stella, who has been ridiculed for her studies in mythology, is also an expert in the Peacetaker, a figure found in legends from around the world, with roots in ancient African, Chinese, and Middle Eastern history. The Peacetaker is a regular boy, born under special circumstances, with the capacity to bring chaos to the people around him when someone puts a locket around his neck. He can cause average people to behave so completely enraged, they will fight each other to the death without realizing it. When a modern-day Peacetaker is discovered, and falls into the wrong hands, terror ensues. After massive casualties, first in Egypt, and then Washington, D.C., Carter needs to find some answers quickly. Carter and Stella are both likable characters: Carter, with his military background, is a great strategist, while Stella is intelligent and passionate about her work. They do not hesitate to put their own lives on the line to protect American citizens, while fighting their own personal struggles: Carter and his relationship with his estranged daughter and Stella regarding a nasty divorce from her husband. The attempt to make Carter and Stella dynamic characters fits well with the themes of the story, but at times feels forced. Petrick is somehow able to pack an impressive amount of background info on the Peacetaker within the novel. She weaves legends and history throughout conversations between Stella and Carter and somehow builds the tension of finding the modern-day Peacetaker before he is summoned to strike again. While the information is important, there is a large amount of it, and at times it takes away from the action. There is no lack of plot in Ribbons of Death. It’s an adventure that takes Stella and Carter cross country in search of pieces that will help to better understand how to stop the Peacetaker. Meanwhile, we have no idea who the Peacetaker is and where he will attack next, and when he does, Petrick shifts perspectives so we see the events from the eyes of the people who fall under the spell of the Peacetaker, which is somehow even more ominous. 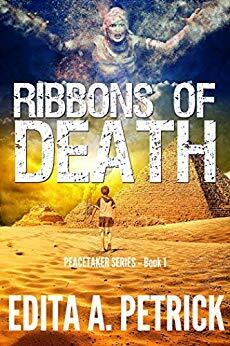 Ribbons of Death is a thrilling read about a race to stop mass numbers of people blindly turning against one another because of the work of an entity believed to exist only in legends. Full of unexpected twists and turns, it will captivate readers until the closing scenes.